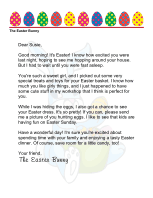 Great for children who didn't get to dye eggs for the egg hunt, this free, printable letter from the Easter Bunny assures kids that he brought his own eggs to hide. Easter is getting close, and I'm getting ready to bring lots of fun goodies right to your home! Your parents told me that you were worried about the egg hunt this year because you didn't get the chance to dye any eggs. Don't worry! Sometimes I get busy too, or I eat all the eggs instead of hiding them. That's okay. When I come to your house, I'm going to bring my own eggs. 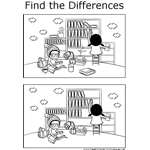 Some of them might even be hollow and plastic, and you can find fun surprises like chocolates and little toys inside of them! 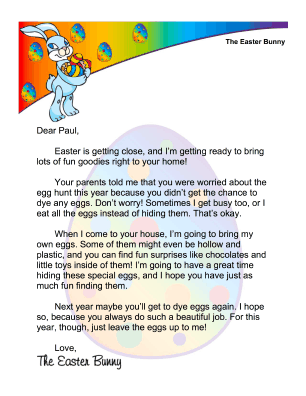 I'm going to have a great time hiding these special eggs, and I hope you have just as much fun finding them. 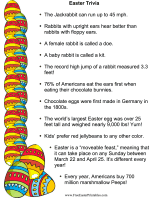 Next year maybe you'll get to dye eggs again. I hope so, because you always do such a beautiful job. For this year, though, just leave the eggs up to me!